EAGLE COUNTY, Colorado – Part of the forest’s lure is its mystery and unpredictable nature. However, those variables can make it tough to plan for camping. Just because you found the perfect place to park your tent last summer, you can’t necessarily expect to duplicate that experience this summer. Between crowds, fire danger and beetle-kill trees, there are plenty of X factors that can change the course of your trip entirely if you fail to plan ahead. Below, local experts offer ideas for navigating this summer’s conditions in the forest. Solution: Make sure the roads and trails that lead to your destination are open before you set out. One group that stopped into the Minturn ranger station recently said it drove all the way from Michigan to visit Hanging Lake Trail near Glenwood Springs, only to discover the trail is closed through Aug. 1 for repairs. In the Vail area, stream surges washed out the Lower Cross Creek Bridge along the Cross Creek Trail off Tigiwon Road. To find out if your camping route is solid, contact the Holy Cross Ranger Districts in Minturn at 970-827-5715 or Eagle 970-328-6388. Call the Bureau of Land Management’s field office in Silt at 970-876-9000. Scenario: Pine-beetle-killed trees are abundant this summer, threatening to fall on campers. Solution: Avoid setting up camp near clusters of beetle-killed trees. Check at least 70 to 150 feet away from your campsite to see what type of trees you are dealing with. Some people suggest setting up your tent at least one-and-a-half tree lengths away from beetle-killed trees. Don’t go camping if forecasters are calling for high winds because trees are more likely to blow over. 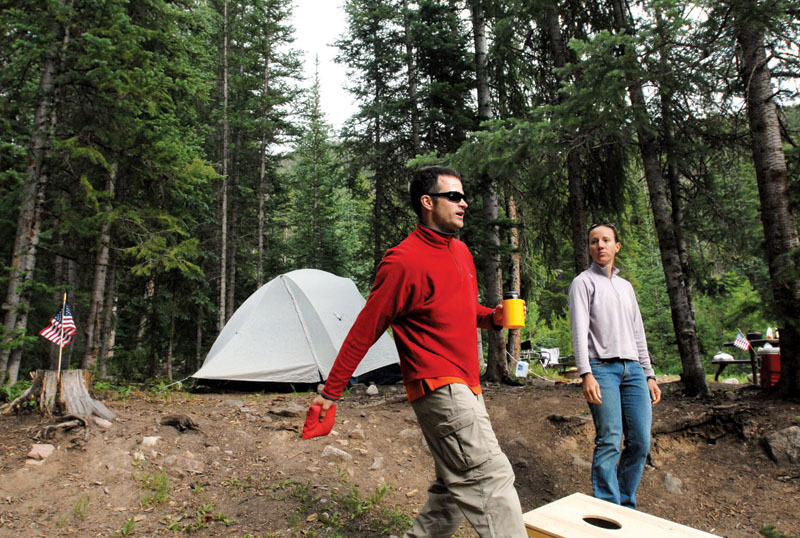 If high winds strike unexpectedly while you are camping, head to a clearing and wait for winds to die down. Carry a saw in the car in case a tree falls across the road to the campsite. Solution: Check cofireban.info to see if any fire restrictions are in place where you plan to camp. Grasses and brush sprouted earlier this year, and could dry out early. Also, weather forecasters predict a warmer than average summer. Currently, fire restrictions are in effect on Bureau of Land Management lands in Eagle County. That includes popular camping areas like Gypsum, Wolcott and Lyons Gulch campgrounds, along with Pinball recreation site. Camp fires are allowed within designated fire grates in developed campgrounds only, so dispersed campers should not build fires. Some areas in the White River National Forest have permanent fire bans. Examples include the Missouri Lakes/Fancy Pass loop, along with Half Moon Pass and the rest of the route to Mount of the Holy Cross. In general, fires are prohibited within 100 feet of any body of water. Solution: For the next best thing, try camping along Forest Service roads. Although dispersed camping lacks the amenities of official campgrounds, some roads are flanked by flat areas and even fire rings that make for comfortable camping. Popular areas include Red Sandstone Road north of Vail, Homestake Road off Highway 24 between Red Cliff and Camp Hale, and Tigiwon Road south of Minturn. – Sources: Ross Wilmore, fire management officer for federal lands in Eagle and Summit counties; Corey Myers, information assistant for the Holy Cross Ranger District in Minturn.